1 Preheat oven to 400°. Line baking sheet with aluminum foil. Toss bread cubes with Country Crock® Spread on baking sheet. Bake, stirring once, 10 minutes or until golden and crisp. 2 Meanwhile, combine Hellmann's® or Best Foods® Real Mayonnaise, 3 tablespoons cheese, lemon juice, mustard and garlic in medium bowl. Toss with hot green beans. Turn into greased 1-quart shallow casserole. 3 Broil 3 minutes or until golden and bubbling. 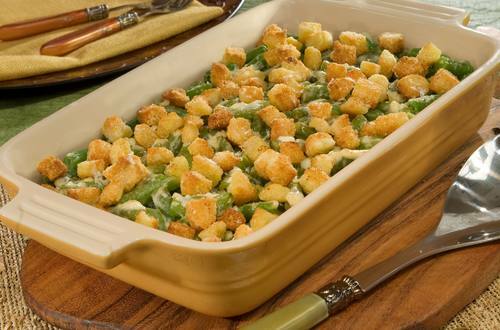 Toss hot bread cubes with remaining 1 tablespoon cheese, then sprinkle over green beans.